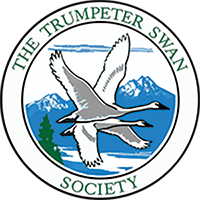 Trumpeter Watch, a Citizen Science program of The Trumpeter Swan Society, encourages observers to help the Society document the changing distribution of wintering Trumpeter Swans in states south of the 40th parallel. In recent decades wild nesting populations of Trumpeter Swans have been successfully restored across the Interior northern states and Ontario. As populations grow, we see evidence that more and more swans are pioneering southward to areas where they may establish more southerly wintering sites. Little is known about these southward moving swans; the duration that they use various sites, the location and characteristic of prime feeding and resting areas, or what problems they may be encountering. Observers are needed primarily in states south of the 40th parallel, during the winter season, to help chart trends in this new winter distribution. You can help! The largest wintering concentrations south of the 40th parallel to date occur in and around Riverlands Migratory Bird Sanctuary in the state of Missouri (along with adjacent southern Illinois) close to the confluence of the Missouri and Mississippi rivers. At the peak of winter, over 500 Trumpeters may be present. Of note is that marked and collared Trumpeters from all the northern states have been sighted here, indicating a certain, but unknown degree of mixing. Observers have tallied Trumpeters in 41 of 114 counties in Missouri, two of which have recorded winter counts of swans over 100 in number. A dozen additional sites note groups of 10 or more. The Heber Springs area of Arkansas is an important wintering site, and observers throughout the southern states are asked to be especially vigilant looking for collared birds marked during an experimental winter release program conducted in cooperation between the Arkansas Game and Fish Department and the Iowa Department of Natural Resources. Kansas birders have recorded Trumpeters in 57 of 105 counties, and Oklahoma observers note them in 17 of 77 counties. We expect the lists to grow. Be the first to add your county! We are compiling records throughout the southern states, and with increased participation, we are starting to look at winter distribution in the western states as well. You’ll find preliminary results of Trumpeter Watch, learn about tools of the trade, and find a chart you can download to help you find the origins of marked, collared, wing-tagged and banded Trumpeter Swans on our website. This is an exciting program that needs YOUR support! We ask that you get involved with sightings, and that you make a donation – however large or small – to support our efforts, through membership or a direct project donation. All of our work is aimed at fulfilling our mission, to assure the security and vitality of wild Trumpeter Swans.